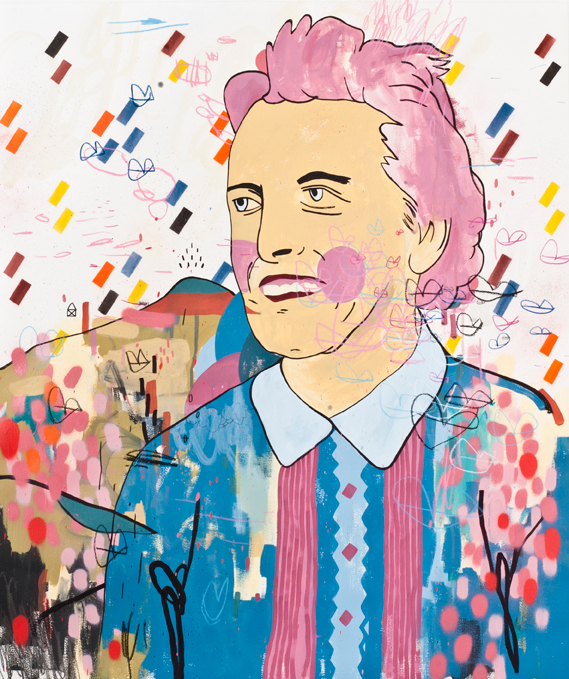 “Collection” is an exhibition of drawings in Paul Senyol’s own neighbourhood. It will be open from the 19th Nov – 23rd Jan at The Field Office, 34 Salisbury Street, Woodstock. While travelling from Cape Town to Dubai, Manchester to Wales, London to Singapore, and finally New Zealand back to Cape Town, Sarah Pratt presents a body of work both inspired and dictated by a ‘Journey’. ‘Away’ invokes feelings of being apart, elsewhere, afar and astray. Travel exposes us to other worlds that, despite our scheduled timeline, seem to exist in a timeless realm. While moving in a systematic manner from point to point, Sarah Pratt harnesses her travel experiences, both physical and psychological, to inform the nature of these works. Using pen, ink and gouache, she focuses on producing a series of works that are an exploration of other-worldliness, works that illustrate another place and are created in unfamiliar environment. Candice Ježek. Caught a Glimpse. Acrylic on Fabriano. The Witching Hour is an exploration of the magical and secret spaces of the world. Artists Candice Ježek and Jade Klara use a whimsical and powerfully feminine style to create rich narratives of unexpected yet somehow familiar themes. Expressed through various mediums of painting, sculpture, and print, they aim to move the viewer to a place of both sweetness and sorrow. The witching hour is a visually stimulating, diverse and powerful showing of the reflections of these two artists’ lives. Opening Event: Evening Opening 16 October at 18h30pm. The show will conclude 9 November at 14h00. Candice Ježek. When You Find It Hold It Near. Acrylic on Fabriano. Bruce Mackay. Ash Cloud #1 – Eclipse. Pen & Ink on Paper. 510 x 370mm (Framed artwork size). Dale Lawrence. Object to Inspire Awe. Edition of 5, plus artist proof. Linocut on Zerkall paper. 645 x 860mm (Framed artwork size); 555 x 765mm (Unframed artwork size). Jean de Wet. Quarry Cove. Pen on Hahnemuhle. 435 x 610mm (Framed artwork size). Michael Tymbios. Harry. Gouache on Hahnemuhle bamboo paper 250 gsm. 805 x 1150mm (Framed artwork size). A group show by Bruce Mackay, Dale Lawrence, Jean de Wet and Mike Tymbios, presented by Salon91 Contemporary Art Collection. ‘Former Mountains‘ is an exhibition, which is predominantly centered around the art and medium of drawing and to some extent print. The artists have been selected to exhibit together based on a strong narrative quality, which is common to their individual practices, as well as for a unique & highly individualistic quality of line which is both present and signature to each of their styles. The artists have each taken a unique approach to the subject of ‘Former Mountains‘, some presenting a number of diverse interpretations of the theme which will be depicted as smaller individual series within their greater body of work, while the other exhibiting artists have taken a more singular approach, ranging from the very literal to far-off poetic and obscure expressions. 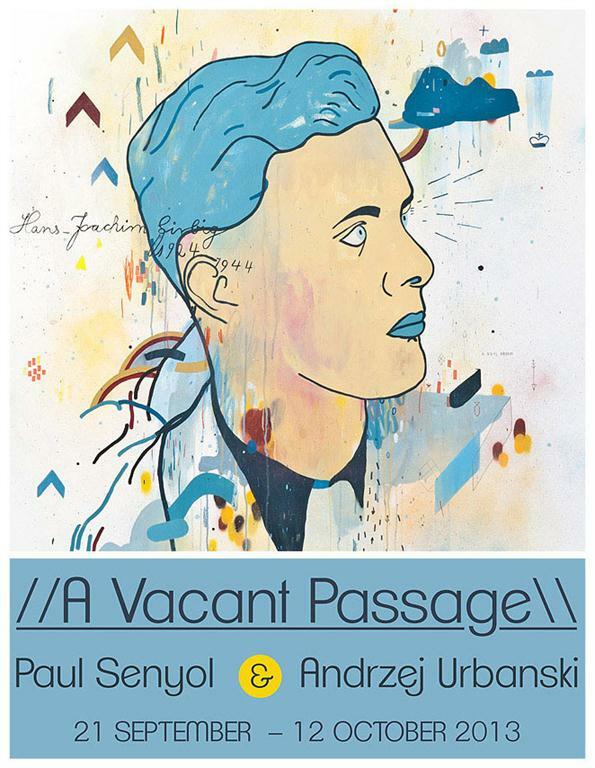 Artists Paul Senyol and Andrzej Urbanski have an upcoming exhibition called ‘A Vacant Passage’ at Salon91 in Cape Town. The past is often a source of inspiration within working practice amongst artists, but how about when two artists meet by chance and share a common heritage and history? Andrzej Urbanski(Pol/Ger) and Paul Senyol first met in Cape Town, during Urbanski’s three month residency early in 2012. There was an immediate connection between the two, and upon Urbanski’s return later in 2012 they began spending more time together exchanging ideas, thoughts and concepts. They quickly began to discover many similarities within their artistic practice and approaches, even though their execution differed greatly. A common visual language, yet different dialects. Up until that time each artist had been writing their own story, looking back, but also looking forward. Uncovering their past they found similar backgrounds, heritage, influences, and commonalities between their families. Both families having lived within a 200km radius of one other. Much of their lives changed at the beginning of the second world war when both families were forced to give up their homeland and way of life. Common roots yet a shared experience of displacement and loss. A vacant passage. For the exhibition the artists reference back to a time and place which no longer exists, both artists having experienced this space and place, and now coming together to seek out and make a story of a puzzle and a past which neither has any recollection of, besides a shoebox of photos, newspaper clippings, essays as well as stories handed down from generation to generation. To the artists’ Germany is a vacant place, Poland is a vacant place, and some day, South Africa might become a vacant place. 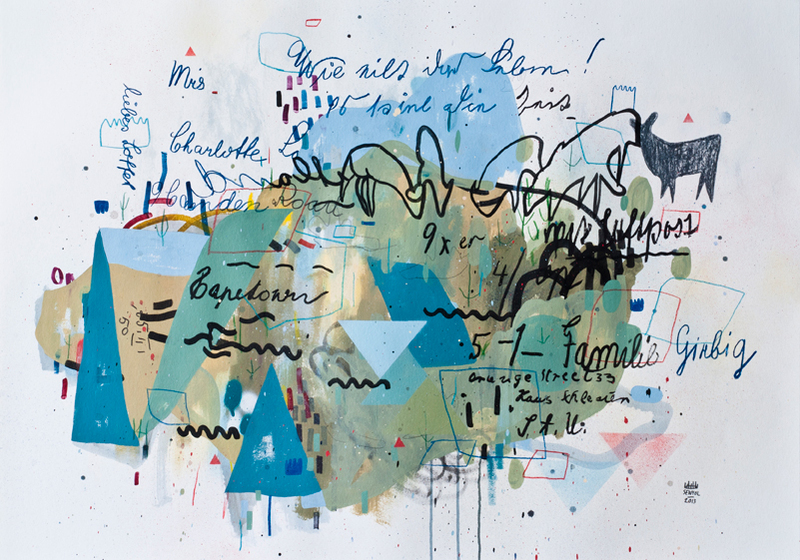 The story of two artists traveling and leaving behind remnants and legacies. The artists will each produce a body of new works related to their history and the common happenings of the years when both artists’ families experienced the difficulties and repercussions of the 2nd World War. 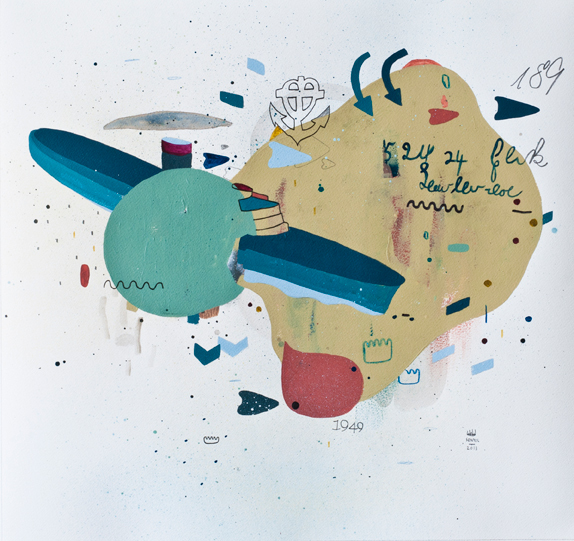 For the exhibition the artists will also collaborate on several artworks as well as a mural within the gallery. “Heart of Gold” is a playful exploration of the concepts of money, consumerism and greed by Jordan Metcalf and Daniel Ting Chong. Following on the form of their previous project Fear.Less, the artists have played with scale and medium to re-contextualise consumer-based iconography and lexicon as art. The pieces are stark, sleek and graphic, using limited colour palettes and diverse mediums such as glass, paper, wood and ceramic. Make sure you check out the show at Salon 91 in Cape Town before it closes on 20 April 2013. During February & March Salon91 celebrates design and typography with ‘Back in 5 minutes’ an exhibition featuring an award winning set of local designers, typographers and illustrators, including Ben Johnston, Clinton Campbell of Studio Muti, Clement de Bruin, Justin Southey and Dani Loureiro. Here are some pictures from the opening night. Justin Southey along with a bunch of other really talented illustrators and artists are in a new exhibition opening tonight at Salon 91. Check out the facebook page over here. We chatted to Justin about his work for this typographic exhibition and if you in Cape Town make sure you attend the opening tonight! 1. You involved with a new exhibition coming up this week. Can you tell us about it? Well, The show is called Back in 5 Mins, and is a show which highlights the use of typography and sign writing in Urban culture. It is a group show of typographers and illustrators and along with myself, it includes; Ben Johnston, Clinton Campbell of Studio Muti, Clement de Bruin, & Dani Loureiro. I see my current work as reflecting the energy, colour and vibrance of the streets, I endeavored to create pieces which were both sophisticated, yet playful. I drew strongly from the local narrative, and allowed my pieces to act as voices of the city. 2. Do you think people have an appreciation for type as an art piece? Yes certainly. Typography, or at least artworks using typography have become increasingly popular as an art form in the last few years. I know it’s more of a popular culture thing but how many re tweets of Keep calm and… have you seen in the last year? 3. How did you get involved with this exhibition? ‘Back in 5 Minutes’ – An Exhibition of Typography from Nicholas James on Vimeo. 4. The video for the exhibition is really beautiful and it looked liked everyone had fun at your studio. What have you learnt through the process of doing your artwork for the show? 5. Any exciting plans up ahead besides this exhibition? You got a totem at Design Indaba right? Ya, I have a bunch of Totem like pieces up at the Design Indaba exhibition (curated by Li Edelkoort). I actually heard about the Design Indaba exhibition whilst creating work for the Salon91 show, I submitted work, was selected, and suddenly found myself creating works for 2 shows which had deadlines on the same day, so needless to say , It’s been a pretty manic past few weeks. I feel really privileged to be part of the show as only 52 people were selected out of over a thousand entries. 6. Where can we see more of your work?